Los Angeles-based heavy metal warriors HOLY GRAIL -- whose epic anthems have been performed live alongside some of the genre's top names, including ANTHRAX, EXODUS, AMON AMARTH, DRAGONFORCE and HIGH ON FIRE, among others -- will release their third album, Times Of Pride And Peril, via Prosthetic Records on Feb. 12, 2016. The follow-up to 2013's Ride The Void was recorded earlier this year with Grammy Award-winning producer John Spiker (TENACIOUS D, FILTER) and encompasses the rise and fall of an empire, showcasing a history of triumphs and defeats through the group's quintessential shreddery. The new album's symbolic artwork is seen below as well as a new teaser video. Following an extensive tour campaign to promote Ride The Void, HOLY GRAIL, who were recently featured in a Star Wars-themed HP commercial, spent much of 2014 writing Times Of Pride And Peril. Guitarist Eli Santana and drummer Tyler Meahl also kept busy by touring extensively with HUNTRESS, whose lead guitarist Blake Meahl is Tyler's brother. Featuring a blistering dual lead guitar attack and powerful vocals by James Paul Luna, HOLY GRAIL burst onto the scene in 2009 with their debut EP, Improper Burial. It was quickly followed by Crisis In Utopia, which was named one of the 20 best albums of 2010. 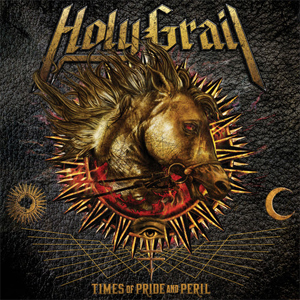 In addition to the bands listed above, HOLY GRAIL has toured alongside such notable acts as BLIND GUARDIAN, VALIENT THORR, ORANGE GOBLIN, HELLYEAH, BLACK LABEL SOCIETY and MUNICIPAL WASTE. The group has also performed at such major international metal festivals as Wacken (Germany), Download (UK), Soundwave (Australia) and Loud Park (Japan). This weekend, HOLY GRAIL will kick off a winter tour that includes dates with DEATH ANGEL, FLOTSAM & JETSAM and NIGHT DEMON. To kick off the new year, the group will then join master guitarist Marty Friedman on the second leg of his Inferno North American tour. Additional dates will be announced shortly. Catch the band live at one of the below stops to hear new material!